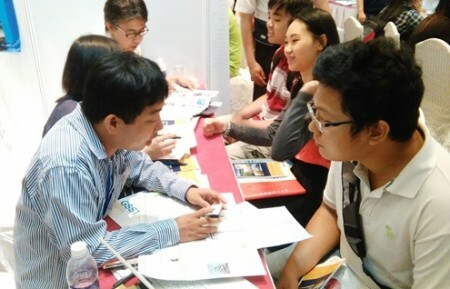 Kumamoto University participated in the Study in Japan Fair 2015 in Vietnam. 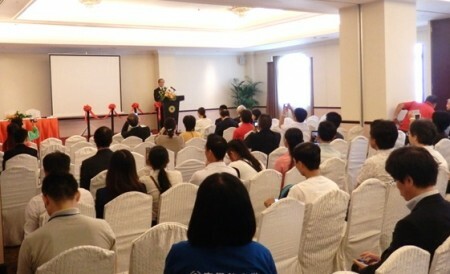 The events were organized by the Japan Student Services Organization (JASSO) and held in Hanoi on October 31 (Sat) and Ho Chi Minh City on November 1 (Sun), 2015. This fair had two main features: (1) an overall seminar, including explanations of Japanese government scholarships and testimonials of students who have studied in Japan, and (2) individual consultations provided by each participating institution. 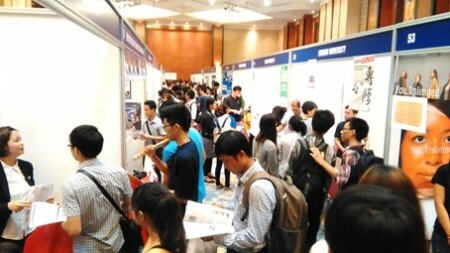 As many as 1,405 students who hope to study in Japan (1,396 last year) visited the Hanoi Venue, while 1,433 students (1,265 last year) visited Ho Chi Minh City Venue. Approximately 100 institutions participated in the fair, and about 200 students visited our booth over two days. We talked to them about Kumamoto, the advantages of our university and the procedures needed to come and study in our universities in English, with interpretation assistance. Most of the students have never been to Japan, nor do they know the location of Kyushu, let alone Kumamoto. However, since many are already studying at Japanese language schools in Vietnam, the brochures written in Japanese were the first to run out. We received many questions about our curriculum, entrance examination system and scholarships, and the students showed their positive intentions to study in Japan. This fair was a great public relations opportunity, a chance to introduce our university to enthusiastic Vietnamese students. 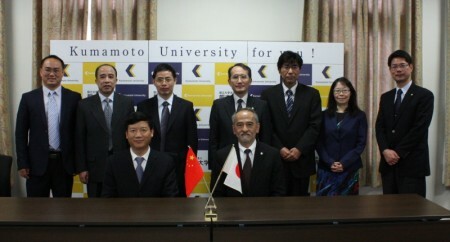 On October 29, 2015, Kumamoto University concluded an inter-university academic and student exchange agreement with Anhui University (China). 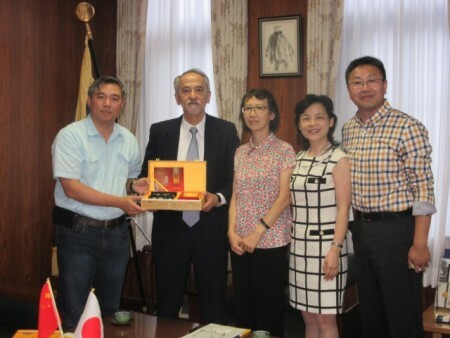 The Center for Hui Studies of Anhui University and Faculty of Letters of Kumamoto University previously concluded a department-level academic exchange agreement in 2010. Now the two universities have agreed to enter into a university-level exchange agreement to expand the scope of the program. Anhui University is a national university with 20 schools. It has many notable achievements to its credit, especially in the humanities and social sciences. The two universities have already enjoyed substantial academic exchanges, including researcher exchanges and joint research in the humanities. President Cheng Hua and three other delegates from Anhui University attended the signing ceremony. As people from both universities watched, President Cheng and President Shinji Harada signed the agreement and concluded with a firm handshake. This agreement will help expand the exchange program to the entire university, and spark new exchanges in new fields of study. 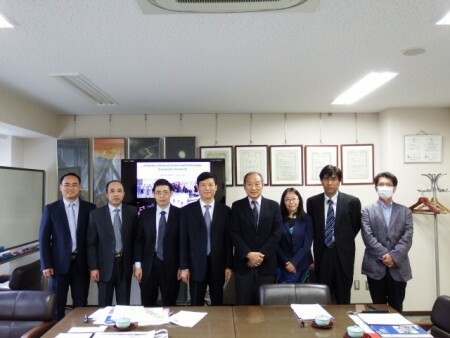 On October 28, 2015, Prof. Xie Qinglin, President of Guilin University of Technology (China), visited Kumamoto University with three other delegates to attend the signing ceremony for a university-level exchange agreement. Since Kumamoto University’s Faculty of Engineering and the Graduate School of Science and Technology concluded a department-level exchange agreement with Guilin University of Technology in 1999, both parties have promoted researcher and student exchanges. The two universities have now entered into a university-level exchange agreement to expand these exchanges to other faculties. President Xie and President Shinji Harada signed the agreement at the signing ceremony and concluded with a firm handshake. This new agreement will expand the scope of the program to the entire university and further strengthen the ties between the two institutions. In advance of the signing ceremony, the delegates visited the Graduate School of Science and Technology and exchanged views on student exchanges and the possibility of joint research. The universities agreed to deepen their friendly relationship. On October 26, 2015, Japanese language teacher delegates from the Department of Japanese Studies, Faculty of Humanities, Airlangga University (Indonesia) paid a courtesy visit to the Director of the College of Cross-Cultural and Multidisciplinary Studies. 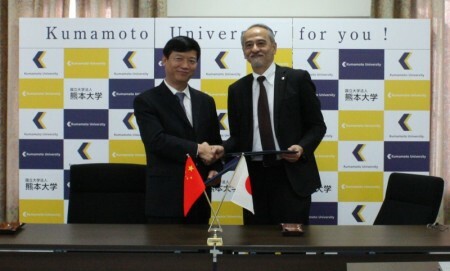 Kumamoto University and Airlangga University have had active student exchanges since the conclusion of a university-level exchange agreement that was signed in 2013, during the Kumamoto University Forum Surabaya, Indonesia. Since the following year, Kumamoto University has accepted Japanese Studies Students (Japanese government-funded foreign students with embassy recommendations) and undergraduate exchange students. Those from the two universities exchanged their views about the present status of Japanese language education at each university, and how best to deepen university-level cooperation in the future. Both sides reaffirmed their further promotion of exchange activities. The delegates also observed Japanese language classes at the Center for Japanese Language and Culture, College of Cross-Cultural and Multidisciplinary Studies for three days from October 26 to 28, 2015. This was followed by a discussion and workshop for the Indonesian teachers, where they put their observations into practice under the guidance of the Center’s Japanese language teachers. 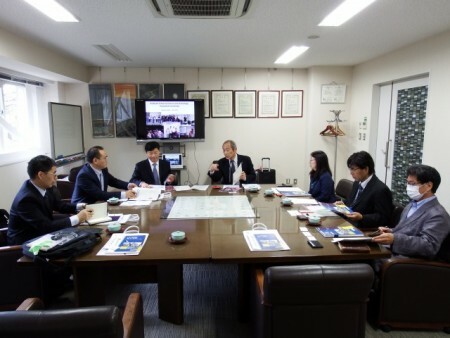 They expressed their gratitude and remarked that they would like to further improve Japanese language education at their university by using the Japanese language teaching methods learned through this experience. Their visit was a truly fruitful base for future exchanges between the two universities. 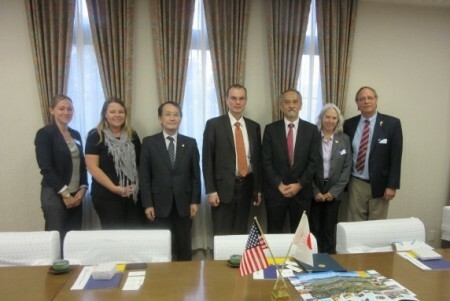 On October 13, 2015, President Shinji Harada and Professor Kazuki Takashima (Vice President for International Affairs) received a courtesy visit from a group of six delegates from Montana State University (U.S.). The group was led by David L. Di Maria, Ed.D., Associate Provost, Office of International Programs. Since the conclusion of an international exchange agreement in 1987, for almost 30 years, Kumamoto University and Montana State University have maintained a close relationship, particularly focusing on student exchange programs. The representatives of the two universities held a frank conversation on student exchange programs and the possible implementation of scholarly exchanges between researchers. After the courtesy visit concluded in a friendly atmosphere, the delegate group also interacted with former Japanese exchange students and other Japanese students who had studied at Montana State University, aiming to share their learning experiences/outcomes in the United States and listen to their opinions on student exchange programs. On October 2, 2015, President Shinji Harada received a courtesy visit from a group of four Chinese graduates of Kumamoto University. The group members consisted of Jun Wu, Ph.D. (Beckman Research Institute, City of Hope, U.S.); Yi Ding, Ph.D. (Professor, Tsinghua University, China); Luxia Liang, MD, Ph.D. (CEO, Fantastic Bioimaging Co., Ltd, China); and Daniel Wang, Ph.D. (Southport Healthway Clinic, Canada), all of whom graduated from the Graduate School of Medical Sciences or the Graduate School of Pharmaceutical Sciences at Kumamoto University. It was their first visit to the university in about twelve years. (from left) Jun Wu, Ph.D.; President Shinji Harada; Yi Ding, Ph.D.; Luxia Liang, MD, Ph.D.; and Daniel Wang, Ph.D.